It can be difficult to find the ideal ceiling fan for your home. With so many different styles and types of fans to choose from, you may not even know where to begin. Failing to properly research which type of fan is right for your needs could lead you to making a hasty decision that you might end up regretting. Fortunately, the lighting experts at Distinctive Lighting are here to help. That’s why, in today’s article, we will be taking a look at a few different types of ceiling fans so that you can get a better idea of which type is right for your home. Distinctive Lighting is Montana’s best lighting showroom that serves Bozeman as well as the surrounding areas of the Gallatin Valley. With more than 30 years of expertise in the lighting industry, our team of friendly professionals are here to help you every step of the way by addressing your lighting needs. We know that no two homes are alike, which is why we offer the widest selection of interior lighting products, exterior lighting products, and so much more. To learn more about some of the many different types of ceiling fans, continue reading more on the subject below. Standard ceiling fans are one of the most popular options for homeowners that are looking for a basic solution for circulating air throughout their home, and are often the most affordable choice. These types of fans are available in many different colors and materials, and some are even made from the finest natural wood grains. For this reason, standard ceiling fans are exceptional for homes of almost any kind. If your home sports a modern look and feel, you most likely want a ceiling fan that blends seamlessly with your home’s style. Not only are low-profile ceiling fans incredibly aesthetic, they are also mounted much closer to the ceiling. This is one of the reasons why low-profile ceiling fans are an exceptional choice for home’s that have low ceilings. One of the most unique looking ceiling fans currently available for purchase are dual-motor ceiling fans. These types of fans sport two unique blades and they are meant to give your home a decorative twist that both your friends and family will love. Many dual-motor ceiling fans feature leaf-like blades, which can be an excellent way to bring the look and feel of your home to life. These are just three of the different styles of ceiling fans that complement many different styles of homes. 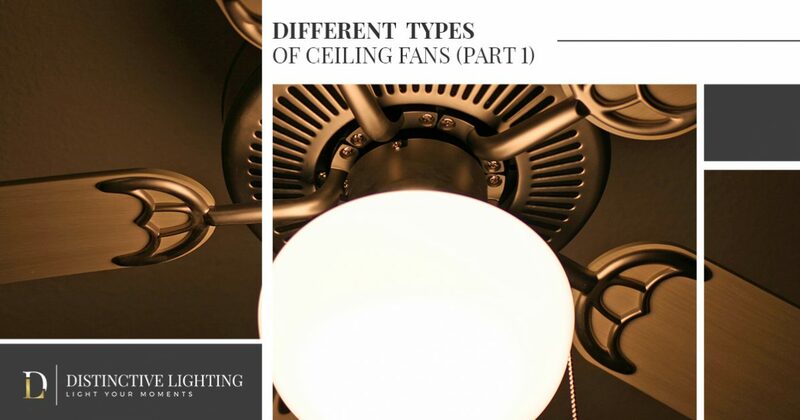 In part two of our multi-part series, we will be taking a look at three different types of ceiling fans that can work to unify various areas throughout your house. If you would like to view all that Distinctive Lighting has to offer, stop by our lighting showroom in Bozeman today! We know that you will be more than pleased with our comprehensive selection of the top lighting products, and we can’t wait to bring your lighting dreams to life!